While much of the early history remains undocumented, those immersed in the tradition talk of three Italian immigrants (Vicente Brunetti, Salvador Venturo and Cecilio Pascarella) who brought some of the styles and techniques with them to Argentina. 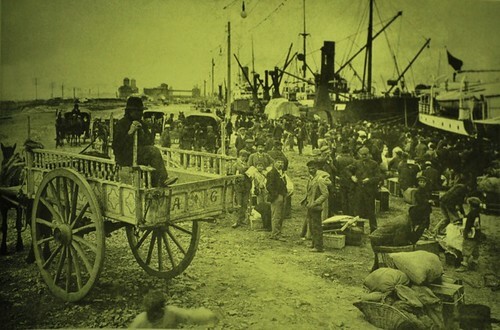 Immigrants arriving at the port in Buenos Aires, Argentina, in the early twentieth Century. Simple decorations can be seen on the cart. ‘Porteño’ refers both to the people and the culture of the port, especially of Buenos Aires. Top: Fileteadore Gustavo Ferrari at work. At first the decoration was relatively simple, a square frame with dots in the corners, following the shape of the cart’s panels, and repeated on each panel. The initials of the trader’s name would then be lettered in one of the panels. 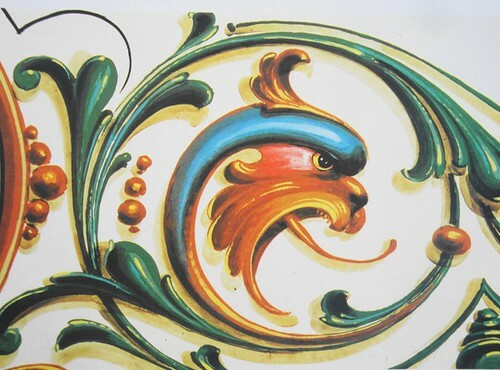 Over time, and with the profound influence of fileteadore Miguel Venturo, it grew more and more complex until the current set of defining characteristics emerged: acanthus leaves; flowers; birds; dragons; flags; and longer texts featuring popular sayings and humour. Decorated panel by Gustavo Ferrari featuring many of the classical icons and motifs of the Fileteado Porteño tradition. 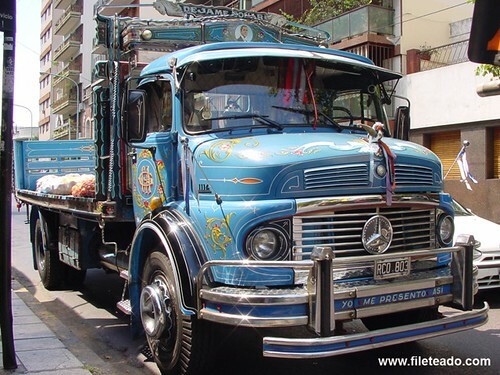 The 1920s and 1930s saw the techniques applied to buses and truck decoration – particularly prevalent in Buenos Aires. The following decades were something of a Golden Age, with the vernacular style developed to its full potential in the work of the two greatest fileteadores, Carlos Carboni and Leon Untroib. They became the craft’s most respected painters, although with contrasting styles. Detail of dragon and flourishes from a panel by Carlos Carboni. Carboni’s designs strived for perfection with their elegance and subtle brushstrokes, while Untroib was renowned for the voluptuousness of his ornaments, his imagination and his explosive colour combinations. 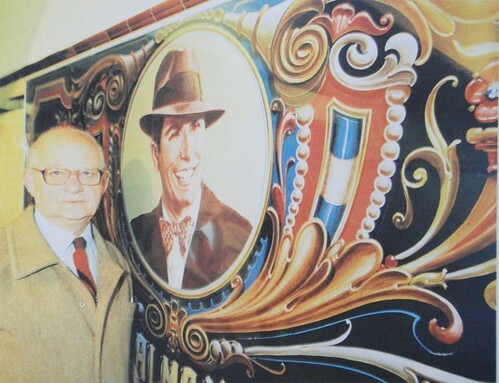 Leon Untroib and his Carlos Gardel Mural for the Buenos Aires Underground (1985). 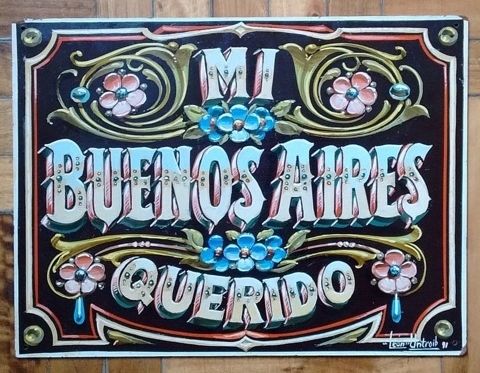 As a folk art, Fileteado Porteño failed to attract recognition as an artform until around 1970, when works were began to be exhibited in art galleries and the style was reappraised and appreciated. However, this newfound recognition coincided with the economic slump of the 1970s, and a decline in demand for the traditional work on trucks and buses. 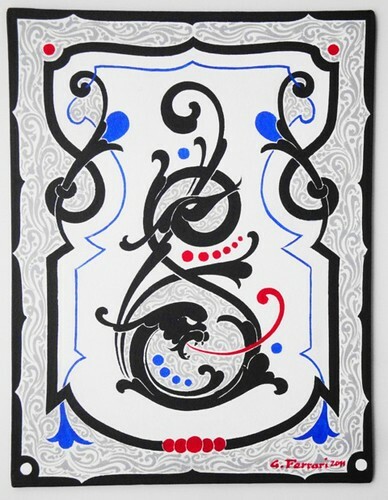 Many artists, including Untroib, responded by turning their hand to signage and exhibition pieces. While the art form achieved a higher status, it lost some of its ubiquity on the streets of Buenos Aires. The 1980s and early 1990s saw the art all but die, along with many of its master practitioners, but the late 1990s saw a resurgence of interest, alongside renewed international enthusiasm for Tango dance and music. Both artforms became symbols of Buenos Aires and its culture. This new interest led to demand from brands and their agencies to use vernacular forms in their campaigns. Evian, Nike and Red Bull are just some of the companies that have used Fileteado imagery to identify their products with the lifestyle of the porteño [port-dwellers]. Logo for Red Bull Argentina, 2012, with fileteado by Alfredo Genovese. One of a number of branding commissions this century. 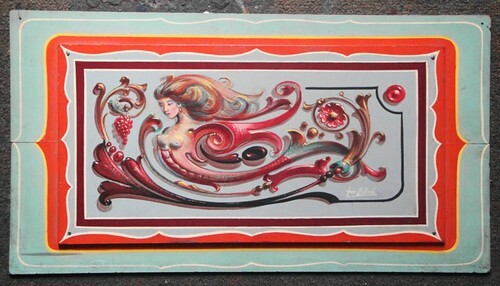 In parallel, Fileteado began to influence other disciplines such as tattoo, body painting and street art. Amazing combinations of designs, colours, and innovative ideas have been the result of these developments. Alfredo Genovese is the most important contemporary artist leading this trend, opening up new paths for future fileteadores. Truck painted by Enrique Arce, showing the use of Fileteado on contemporary vehicle decoration. 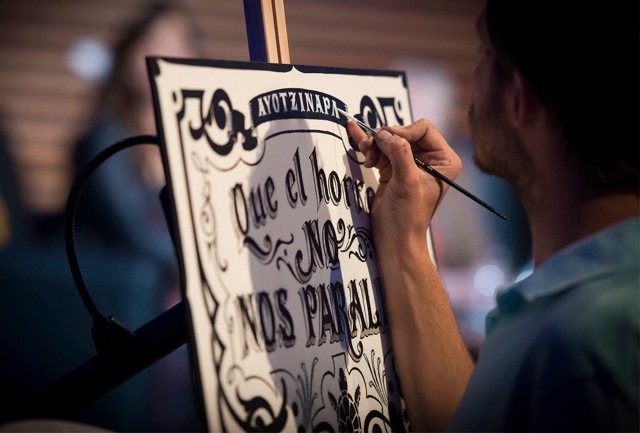 Fileteado Porteño has become synonymous with the visual identity of Buenos Aires, and can be found on shop windows, murals, signs, and printed advertisements. The techniques used are largely unchanged, with drawings made on tracing paper, pounced and transferred to the substrate with chalk or charcoal powder. Ox hair brushes are used to build up the layers: background; flat colours; shadows; drop shadows; lights; and highlights. An Asociación de Fileteadores was founded in 2012 to preserve the legacy and promote the craft. Along with the City Government, the Asociación was successful in their application to have Fileteado Porteño recognised by UNESCO. In 2015 it was inscribed in the Representative List of the Intangible Cultural Heritage of the Humanity, a fine achievement for this vernacular folk art. Gustavo Ferrari is a fileteadore from Buenos Aires, and he will be teaching two introductory workshops in London (23-24 July 2016) and in Berlin (6-7 August 2016). With thanks to Sam Roberts, Better Letters / Ghostsigns. Mermaid panel by Leon Untroib. ‘Otros yo obra [Other people’s work]’, 2012, a fileteado by Gustavo Ferrari, also the author of this article.